The North Carolina chapter of NAACP complained to the state about “rampant” voter purging in three counties. 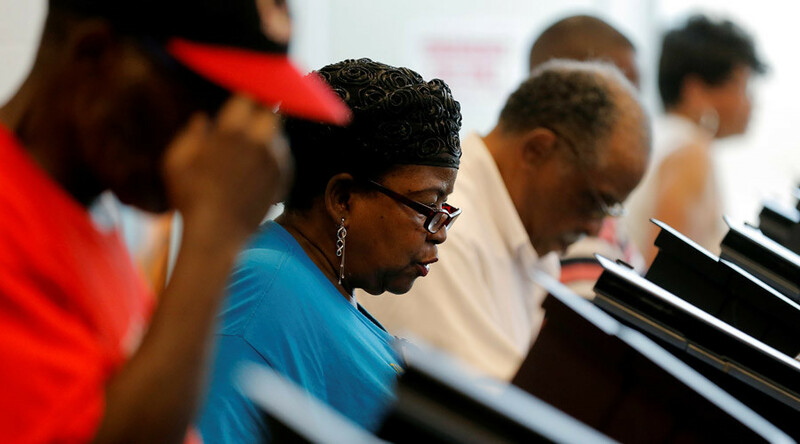 Thousands of voters are affected, including one a 100-year-old African-American woman, who may lose her vote over an incorrect mailing address. Grace Bell Hardison, 100, from Beaufort County was told her voter registration was being challenged and if she did not appear before the county Board of Elections meeting or return a notarized form, she would be removed from the voting rolls, WCNT reported. Her registration was challenged by Shane Hubers, a Belhaven Republican, based on a 2015 mailing by a candidate for mayor that showed her mail was returned as undeliverable. Hardison has lived in the same house her whole life and voted regularly for 24 years. In all, 138 Belhaven residents had their status challenged, with 32 challenges already dismissed. Of the 138 challenged, 92 of them were black and registered Democrats, 28 voters were unaffiliated, 17 were Republicans, and 1 was Libertarian, WNCT reported. The systematic removals of voters were “prohibited by the National Voter Registration Act of 1993 and violate North Carolina voter registration laws,” the head of the North Carolina chapter of the NAACP said in his letter to the state board of elections. Rev. Dr. William Barer demanded of the elections board to “cease from this unlawful purging of registered voters from their rolls, and to restore the voters how have been improperly removed,” and threatened a lawsuit in the letter, dated October 17. According to the letter, the purge of voting rolls occurred in Beaufort County, Moore County and Cumberland County, when vote challenges were submitted based on returned mail from mass mailings. The returned mailings resulted in 400 voter challenges in Moore County and 3,000 in Cumberland County, the NAACP complaint said. The state board told the civil rights group that it would have to take up the complaint with the various county boards of elections and file complaints at the county Superior Courts. The NAACP complaint comes as 14 US states have adopted restrictive voter ID laws ahead of the November 8 elections. This is the first presidential election after the 2013 US Supreme Court decision to abolish a key provision of the 1965 Voting Rights Act, allowing nine Southern states to change their election laws without federal approval. State police raided the offices of the Indiana Voter Registration Project (IVRP) on October 4, seizing documents and equipment and shutting down the group’s operations a week before the voter registration deadline in the state. It is uncertain whether the 45,000 people the IVRP registered will be permitted to vote this year. The organization was launched in April 2016 to improve voter participation, in particular in Indianapolis and suburbs of Chicago. Indiana had the worst voter turnout nationwide in the 2014 election. Connie Lawson, Indiana’s Republican secretary of state, sent a letter to state election officials and accused the group of being a “nefarious operation,” reported the liberal blog Think Progress. Indiana Governor Mike Pence is the running mate of Donald Trump, the Republican presidential candidate.